Sorry friends for being away for a little longer while and specially sorry that I am still not done with the upcoming posts related to SGS, not even started yet. But will be back very soon. Update: Sorry to bring the bad news again, but its almost confirmed now that there will be no PR2.0 before the summers that will be May/ June effectively. I know you wont believe me easily considering the recent rumors floating on the air, but there are big reasons to believe on it now. If one only want to count the numbers then symbian^3 really been frequent about the updates than any other Symbian version ever been, but still since the day of launch, though the updates bring us a little smile here and there, still the wait for PR2.0 been making symbian lovers impatient. Like now, Symbian^3 received another firmware update PR1.2 and this been such microscopic that it was hard to spot the changes on the user end though here goes the official change log. We have released a voluntary software update for Nokia Symbian^3 smartphones primarily to address a synchronization issue identified in a limited number of Nokia smartphones using Mail for Exchange on Microsoft Exchange Server 2010, Service Pack 1. We listen to people’s feedback and continue to constantly improve the user experience of our smartphones with software updates. While we are working to make available the next software version, which will provide a renewed user experience, including new browser, refreshed widgets and home screen as well as many other performance enhancements, we released this software to quickly resolve a potential issue affecting our business users. The software update will be available through the on-the-device Software Update or using Ovi Suite. The roll-out schedule will be determined operator by operator, market by market. Q: What is new with this software update? What are the benefits? A: The primary reason for releasing this update is to address a Mail for Exchange synchronization issue. It will also include a new version of Ovi Store as well as a new version of Ovi Maps (SR6), adding visibility to subways, trams and trains, real-time traffic, safety alerts, visibility to parking and petrol stations, speed limit warnings, and improved search and location sharing capabilities. 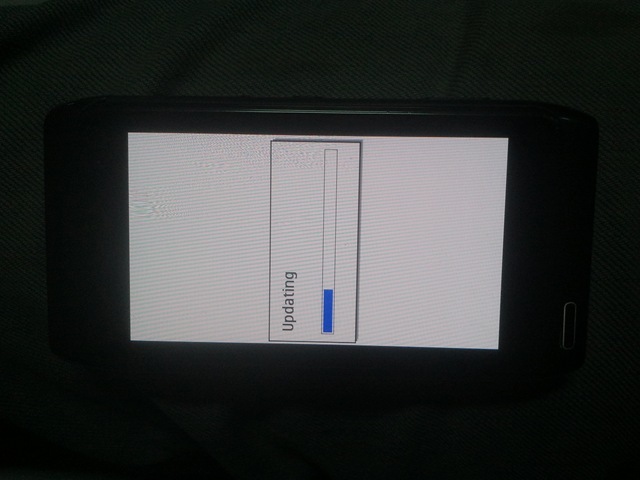 Q: How can I update the software on my Symbian device? Q: Will the software update be pushed to users? A: No, this is a voluntary software update. Users who have signed up with MyNokia or enabled the software update auto-check will get a notification about the update on their homescreen and will be able to download the new software from the Software updater in their device, if and when the update is available for them. 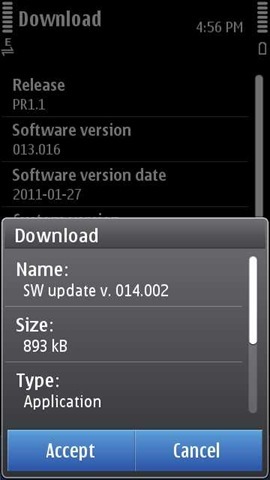 Q: Why does the Symbian device variant in country X not have the SW update yet? What is your roll-out schedule? A: We first publish standard non-customised versions of the software. Country (SIM-free) and operator versions will be following soon. You can check if an update is available for you from Nokia Care. pS: As this is an optional release we have some countries & operators that are not taking this version! Q: I’m on a SIM-locked device with operator X, they are not offering the update. My MfE is not synching. What can I do? A: We will offer this update content also as part of the PR2 software. Q: How can I check if I have the latest SW? A: Go to Applications > Software update (N8, E7) / Applications > Tools > Software update (C6-01, C7), on your device and see if there are any updates available. Q: Is the rollout of PR2 affected by this? A: We’ve announced we will introduce significant improvements for the Symbian UI during the first half of 2011. That schedule remains unchanged. Q: You have promised a new SW with browser and portrait QWERTY. Why are those not available in this release? A: We hope that consumers will be very excited as we continue to enhance our smartphone experience in 2011. We are not stopping here but there are further improvements on the way. We anticipate the software to be available in the summer. So while in the big paragraphs, you do not find anything even remotely bigger to smile upon, we are bombarded with the official words that PR2.0 is coming in summers only, which makes it effectively May-June contrary to all the expectations. Why we Symbian Users still waiting for those things to come after months, when other platforms had them years before? Isn’t it like feeling shamed, when one asks that what we expect from next update that will come after 2 months? The real question is why is it postponed? Corporate under the table games or non-efficient developers? Somehow I think it’s the first reason. Sad, but this is why Symbian loses it’s popularity. Pr 2.0 is expected to be released within 2-3 weeks, so it could most probably be 12 April. The speculations are based upon Qt4.7.2 release, which should not a lone factor. There is much pressure over Nokia to release it early but if it disappoints then it will close the doors for symbian, so obvious delays. Thats not just logic. Thats rlleay sensible. Next Next post: Layman’s take: Nokia BH905i – How serious are you about music?